Today we’re going to talk about Setups in Sim Racing. Firstly, let’s be brutal and honest about this. When you’re sat in a lobby looking at the times your fellow drivers are setting and they’re faster than you, it’s not always the setup. In fact, in my experience, line, breaking points, steering input and throttle application are far more important as a whole in making the difference. Recently in the rFactor 2 Worlds Fastest Gamer Competition I got hold of a setup that was used by a chap in the top 10 in times. I improved by one tenth of a second and was still listed somewhere in the middle of all those who entered. Just because a setup works for someone else doesn’t mean it will work for you. Nor does it magically give you their talent. Knowing your own limits, your driving tendencies and what makes you lap more favourably is key, I believe. 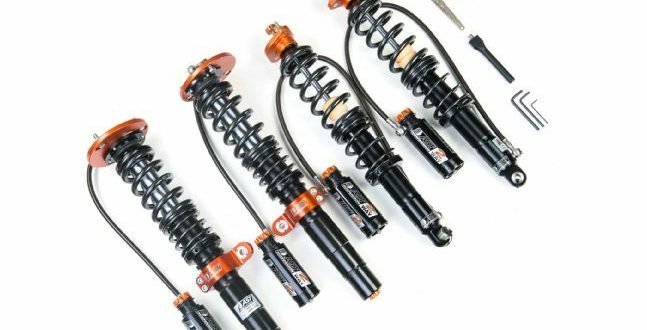 But obviously if your car isn’t turning in or is unstable on the breaks or any other specific issue you may be facing, you may be able to tweak the setup to suit your style more. We’re going to talk about different things to look for, how they may feel and what can you do about them. I will also share what I use as reference to help me. First up – Understeer. To make a car more compliant, you only need to understand a couple of concepts initially. Then it’s about looking deeper and really fine tweaks. Understeer is where you turn your wheel but the car doesn’t turn as expected with the tires scrubbing over the track surface. The very first question you should ask is if you’ve tried to go in to the corner too fast. Back up the corner a bit. This is to say, break a touch earlier. 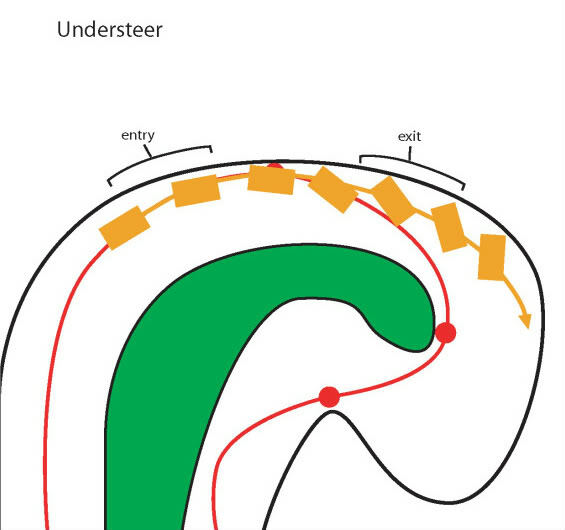 Understeer, Red line is intended, yellow is understeer. You will have to change different things to help understeer at different phases of the corner. Is the understeer at entry, apex or exit? If at the entry of the corner, as is most common, I would say, you can try the following. The resources I will share at the end of this post will explain further possible tweaks. Oversteer is where the rear steps out from the intended direction of travel. Instinctively drivers normally add steering input in the opposite direction of the turn. Much like understeer, oversteer can strike at any phase of the corner. So what can we do about this? Here are a few tips on oversteer on exit. Again, the resources below will offer some help on other phases of corners. There is no magic fix when talking about setups in sim racing. 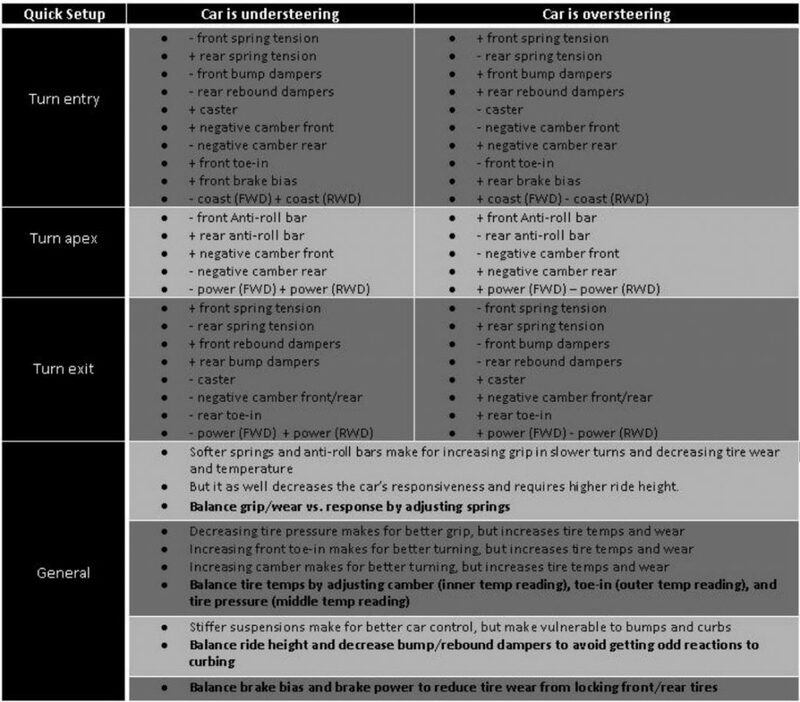 But the following resources are how I, personally, approach setting up my car for an event. One thing I have done many times is just make one drastic change at a time of a setting I don’t know the function of. What’s a fast rebound at the rear? I didn’t know. So I would max it out and do a run. Then I would put it to minimum levels and do a run. Then make sense of the differing feelings the changes provided. It’s a very hit or miss way of doing things but the objective isn’t specifically to get faster, it’s to learn in this case. I find it fun as you need less things like this article, you just know what something does. My go-to solution are cheat sheets. There are loads around but I’ll provide a couple below. These are simple pictures that describe a situation and list possible solutions. I’ve used the Virtual Race Car Engineer software in a previous version. You basically enter details for the circuit and then details of the possible parts you can tweak for setup on your car. Then enter your current settings. You do a lap, enter your time and tell the software how it felt. It then suggests possible changes. It’s a nice piece of software that has just been updated for 2018. We hope these few tips and possible solutoins will help with your setups in sim racing. Let us know what you think in the comments.